I was sent these shoes two weeks ago, and I am loving them. They are great for running or walking. My feet feel like they are walking/running on air! These shoes weigh 6 oz. Seriously... that is so light! The seams are virtually nonexistent... they call it "ultrasonic" but I would not have even known there were seams because the shoes are so smooth. That makes for some comfy piggies indeed! They use a Micro G® cushioning in the heel that rebounds the impact into forward momentum. I am not the best runner, so I love this feature. I can use all the help I can get!!! They have a minimalist appeal as well. The drop is 6mm. I am a huge Under Armour fan. I wear only UA capris for working out and love all of my sweat wicking tops from them. I worked a campaign with FitFluential a few months ago and got my first pair of UA shoes. I liked them, but now that I have tried these, I realize the importance of the weight of the shoe. I am not sure I could run in heavy shoese again. These shoes actually fit my feet. I was a bit nervous at first because my feet are wide, but these shoes fit perfectly. Their inspiration came from spacesuits and they paired that with the material innovation of a bra to create a seamless heel cup.... (yes, a bra!) UA SPEEDFORM® is a new way of making footwear. Best of all, my son thinks I look really cool in them :) And let's be honest... if I have his approval, then I must be a really cool mom! Right? 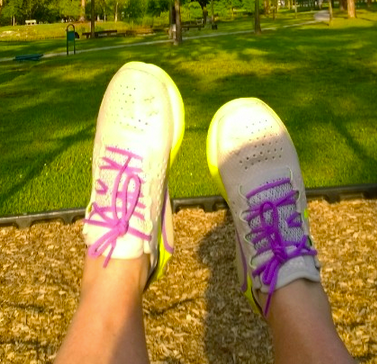 We are very lucky because Under Armour is giving a pair of SPEEDFORM® RC on my blog! Yay! Yes, that means YOU can win a pair too! I run in Mizuno Wave Rider 17 and I love them! I love my UA running shoes and would love to try this pair!! My running shoes are getting warn out and I could use a new pair. I don't run much, but I love running shoes for walking and other sports and activities. Thanks!! I've actually never tried a pair of UnderArmour shoes because my normal running store doesnt carry them! I'd love to be able to test them out; I've heard only good things! I need new speed shoes and I'd love to try these. I love Under Armour clothes so maybe the shoes are really good too! I would love to try a new pair of running shoes! I'm impressed with the reviews I've read and would love to try them out! I typically run in Asics, but love trying out new brands. I've never tried UA - but do wear a TON of their clothing! I typically run in Brooks shoes and I only wear UA shorts...they fit me perfectly and are so comfortable! I've never tried these and typically have to go with the "cheaper" shoes of Nike or New Balance...anything under $50...sad I know...I'd be overjoyed to have a luxury pair of shoes. You know I'm always down to try new shoes! I'm always looking for new light running shoes! Oh Mindy, I tried these on at the sporting goods store and I was blown away with how comfortable they were. AND they came in my size. It's super challenging to find cute AND cozy shoes in my size! I'm currently running in Brooks and while I love them, I'm looking for something more cushiony. I love UA shoes would love to try these! UA has a bad rep for running shoes so I would love to try them out to see how I feel about them! I'm looking for a lightweight speed shoe! Hm. I've NEVER had underaromor shoes before, you make me want to give them a try! I typically rock Nike Dual Fusions for the support since I do a lot of Body Weight Exercises, jumping around, lifting, and HIIT running! I am in desperate need of new shoes! I would love to try the under armour ones! My husband runs in UA and needs a new pair. Would love to win these for him. I really want to try these. Mindy you are awesome! I've never tried Under Armour shoes but I LOVE their running clothes. I like the way you described them as walking/running on air. I'd love to try them! UA shoes are incredibly comfortable, durable and CUTE!! I'd love them!!! Would love to try them as I am always up for new shoes to rotate with what I've got already. Plus I love their clothes! I've never tried UA shoes, but love trying new things. Love that they are so lightweight! I love all things Under Armour - so I'm sure these would be great shoes. Thank you. Run? HAHAHAHA! I don't run. But I do everything athletic in Reebok. I'd love to try the UA shoes because the ones I am running in now seem to be causing me some issues :/ I KNOW I need a new pair of shoes!! Love the UA brand! Never tried the shoes. They look sweet! I'd love to try UA shoes. I always wear their workout gear but have yet to try their footwear! I would love to try these shoes because I am researching running shoes and haven't tried UA yet! I have been hearing great things about under armor running shoes and since I will be training for a half marathon this summer I will need a second pair of shoes to train in. They sound great! Would like to try them! hahahahaha in whatever the people at Fit 2 Run tell me to ;-) Great giveaway those shoes look awesome!!! I love running in light weight shoes. I've never tried UA. I love all things UA so I'd love to try these! I love the design of these shoes and I just started running again. I'd love a pair of shoes that aren't falling apart because I have to wear them for everything from a trip to the store, to yard work, raking, mowing, trimming trees, weeding, painting, etc. for people. I am new to the running and fitness world and still trying to find what fits me. Would love to win. Ooh I LOVE UA but have never tried their shoes! I have been looking for a new pair of shoes for a while now! Trying to tackle running for the first time EVER and I know shoes make or break the experience! I'm looking for a good pair of shoes to fall in love with for running and the gym! I have never tried this brand and they look comfy. I would love to try these shoes because every pair of shoes I have tried seem to be too narrow or rub my heel. Not only that, but I need a little extra motivation to start being more active. I would love to try these because I never have before! Right now I have nikes 3.0 but I don't like them for running so I would love to try these. UA shoes are fantastic! I would LOVE to try these out for all of my upcoming road races!! :) Great review! I'm trying to find my new favorite running shoes...would love to try UA cause they do good quality work!! Those shoes look awesome, didn't hear about UA until I came across this blog post, I need a new pair of running shoes so I will definitely check this one. I love the features! I'd love to try UA shoes because...I just had a friend tell me how awesome her shoes are! Real story! This would be my first taste of underarmour!! I would love to try out the sneakers. I have some UA gear but haven't tried the shoes yet. I have been wearing Asics for a really long time and I've recently have been having some foot issues so I"m wondering if it's time to change it up. I would love a pair. After major foot surgery great shoes are a must for my running! I have never found the perfect shoe. I would love to try these! I would love these shoes from Under Armor as I am in need of a good pair of shoes that wont cause my feet to hurt when walking and running. I really hope I win them. I run in Hokas. These would be great for my new CrossFit gym. I run in Asics currently. But I also love New Balance & Solomon's! This would be a blessing to win I sure could use a new pair of shoes and my feet would be thanking you when I run or walk!!! I'm looking for a new shoe to run in following a stress fracture. Starting weight loss journey TODAY! I wanna win these because everything else I wear is UA, from sports bra to socks! The only thing I need to complete the outfit is the shoes! I've heard great things about UA shoes and would love to give them a try. My shoes have a lot of miles on them so winning the shoes would be awesome as I would use them a lot - especially since I've signed up to run a few more races this summer. Thanks! I have just started exercising and my shoes have a hole in the toe. Both my boys have UA tennis shoes their Grandmother bought them. It's time Momma got a pair! I'm doing my first 5K Sept. 1! Would love to win these. My daughter has had UA shoes...they look incredibly well made and comfy. I need to find a new shoe the will not hurt my feet while trying to get rid of this weight. I am tired of my feet hurting. Plus my son & husband would be jealous because they LOVE Under Armour! I'd love to try these, as UA is in Maryland, and I like supporting local businesses (smile), and because it's always good to evaluate different shoe brands and to alternate shoes. Although I walk, I complete between 20-35 miles per week, so shoes that are light, comfortable, and able to support this level of activity would be a godsend! Saucony Triumph 9's have been my shoe, but I can't find them anymore so I'm in need of a replacement. It would be great to be able to test these out! I could definitely use a new pair of running shoes and Under Armour is a great brand.. I have been meaning to try their shoes for a long time so this would be perfect! I wear Brooks but recently switched to those from Asics. Definitely interested in trying these out! I would love a new pair of running shoes and these looks so cool and lightweight and I just need to have them! I have been having problems with my shin while running, and I think I need to replace my Brooks, so I'm in the market. I'm always looking for that pair of shoes that will help relive my foot pain. I have heard good thing about UA shoes. I'm due for a new pair of running shoes so I would love to try these shoes! 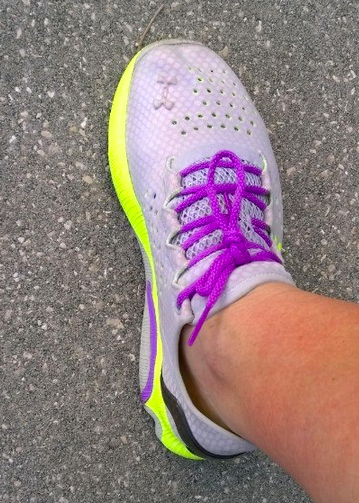 I would love to try these UA SPEEDFORM® shoes to wear on my daily walks. I'm thinking that these shoes being so light will help me do better on my walking as my feet will feel better and not hurt. Thank you for the chance! I need new running shoes for my upcoming half marathon! I would love a new pair of running shoes especially Under Armour ones. I wear out my shoes in record time it seems so I am always looking for a new pair. I exercise daily and I really need a good pair of sneakers. These look epic! I want to try them because they are so lightweight. I have a difficult time finding shoes that are comfortable and would be grateful to try these. Thank you for the opportunity. got one pair UA and love them until now. it has been my running partner for almost a year.